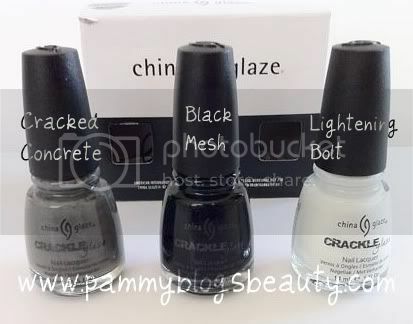 This post is to introduce you to the China Glaze Crackle Glaze polish collection. I will be doing a series of posts with NOTD (Nail of the Day) photos with the various Crackle Polishes. What are Crackle Glaze polishes? Well, like OPI's popular "Black Shatter" polish, China Glaze Crackle Polishes are finishing polishes that separate and "crackle" as they dry to give the most unique look! I mean, seriously, the first time I saw it happen I was amazed (and am totally planning on doing a video demonstration for ya'll). If you love the look of "nail art", but don't have the skill to do it on your own, then you will love these. It is like nail-art for the every-day girl! For my how-to and NOTD, keep reading after the jump! The How To: Its so super easy!!! Apply a regular polish of your choice and let it dry completely. Apply a coat of China Glaze Crackle polish directly on top (cover nail completely). Let dry 3-5 minutes. You will see it starting to separate and crackle almost immediately. Top with a clear top coat. Thats it!!! Easy-peasy!!! Your base color will peek out below the Crackled polish! Very cool effect. It looks like nail art that took hours to create, but in reality...it just took minutes! 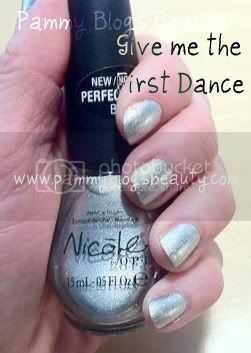 I applied Nicole by OPI's "Justin Beiber" Give me the First Dance polish (which by-the-way is sooooo pretty! It looks like total liquid silver on your nails!). Here is how it looked before the Crackle. 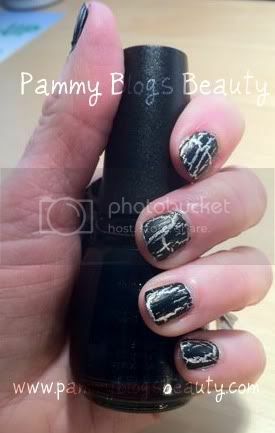 I then applied China Glaze's Crackle in Black Mesh. Here is the final look! I love it!!! What a fun and unique look! I really can't wait to play around with these more and post the various looks that I can create with these cool polishes! I know these are sold out just about everywhere. I lucked out and found the entire collection online through an Amazon seller. But, keep checking back (a.k.a. stalking) your local Sally's for this great collection of polishes. Have any of you tried these? If so, please suggest some color combinations below. I would love to experiment with different base colors! You know Pammy I'm a dork...since I didn't do my research I had no idea the China Glaze also had a "shatter" nail polish...so since my ULTA here were sold out of the OPI one I went on eBay and purchased one for like $18!!! Then I come to find out that China Glaze has one too and they have a different colors too!! LOL Oh well I'm gonna have to get these now! I can't wait till you do your vids on ALL the colors =) Love Ya Chica!! @Priscilla-Hey girl!!! Awh now don't feel too much like a dork girl! The CG Crackle was *just* released a couple weeks ago (and are now hard to find too). But, lol, I know what you mean! These polishes are just so FUN! Yes, totally your style too girl! Love the look! :) P.S> Did you ever get your Birchbox from last month? I am expecting this months's any day now!